Dave and I beat the rush yesterday and showed up right at the opening of the Lucky Lab's Barleywine and Big Beer Festival. That made it a much more relaxed tasting than last year's -- no waiting in line, no shortages, and a chance to shoot the breeze with the brewers and other diehards. The Quimby Street pub was mostly empty. Many of the patrons were just there for lunch and hardly seemed to notice the treasure trove of gigantic beers available to them. I had been eagerly anticipating another shot at the Caldera Russian Imperial Stout. It didn't disappoint: the 2005 was delicious, with some kind of nutmeg flavor to it; the 2004 (according to the taps -- the menu said 2003) reminded me in a good way of this year's barrel-aged Top Sail. The texture was really interesting on the 2004 -- lots of tiny bubbles, almost like nitro bubbles, but fizzier -- whereas the 2005 had almost no carbonation. No matter, the 2005 was just beautiful, one of my top 3 for the day. Dave described it as "chocolate steak milkshake". Neither one of us is really ready to write for Wine Spectator. If you ever see this on tap someplace, please leave a comment. My very favorite beer of the day was Terminal Gravity's 2005 Barleywine. It was unmistakably a barleywine, plus an extra helping of floral hops. The hops were balanced with just the right amount of sweetness, and there was a good wallop of medicine in there too: 13.1% ABV. It was a beautiful thing. A nice surprise was the Fort George 2007 Sistine Chapel Imperial IPA. This got listed on the "big beer" side of the menu because of its name, but it looked like a barleywine, and smelled like a barleywine, and tasted just exactly like a barleywine, so let's call it a barleywine. I can see the temptation to call it an IPA, because it was very hoppy, but it was hardly alone in that regard. The Chapel has a very beautiful perfumed hop flavor that went well with the strength and sweetness. 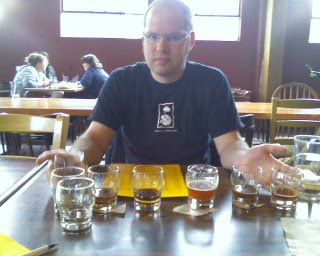 2007 was a great year for new breweries in Oregon: Fort George is definitely one to keep an eye on. Makes me want to head out to Astoria. On the flip-side of the Barleywine/IPA coin, Full Sail's Old Boardhead was definitely more like an IPA than a barleywine. There was something really strange about this beer: at first it was one of the best, but it got worse as it warmed up, which is not the way things usually work for me. First taste, it was very hoppy: flowery hops at first, becoming bitter for a nice long finish. Later, there was only a kind of dry bitterness, and the long finish was more like a bad aftertaste. Moral: drink it fast. I'll mention a couple of oddities that didn't make it into the rankings. New Old Lompoc sent over a 1998 Tavern Rat -- yes, 10 years old. You know, it tasted pretty good for being that old, though it was totally flat. It really looked like a glass of sherried whisky, like a Macallan cask strength. I also tried something from a brewery I'd never heard of before, located in a town I'd never heard of before: Laht Neppur, from Waitsburg, WA. Their 2006 Barleywine wasn't quite up to the competition, but I'll definitely check out their pub if I ever find myself out Walla Walla way.